And so it has been. My little step just happened to occur inside Sigurd Olson’s Writing Shack on August 3, 2015. Upon entering the Shack for the first time, my eyes swept over the solid desk and classic typewriter, the table full of rocks and other outdoor treasures, and the many happy pictures of people and adventures from years past tacked to the walls. 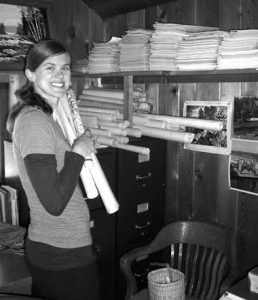 Among other things, I also happened to notice a number of rolled up, poster-sized papers of varying length neatly stacked on top of the old filing cabinets in the far corner. Maps, I thought. Glorious maps! At least that was my guess, and it turned out to be right for the grand majority of them. But that comes later in this story. Let me take a moment and introduce myself. 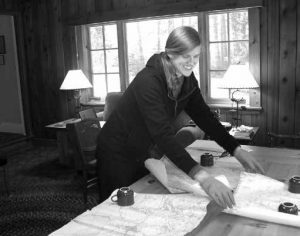 My name is Steffi O’Brien, and I am a lifelong Boundary Waters Canoe Area Wilderness (BWCAW) enthusiast and avid reader of Sig’s writings. I am also currently pursuing my Masters in Experiential Education at Minnesota State University Mankato; a program dedicated to learning and education through hands-on, direct experience, meaningful reflection and analysis, and mindful application at all stages and in all areas of life. Back in August of 2015, I was still searching for a final capstone project for my degree. My hope was to create one that would integrate my passions for lifelong learning, the natural world (especially Northern Minnesota), and the study of geography (especially historical geography and cartography). You can probably see where this is going. bungled communications. Luckily, after persistent phone calls and voicemails from both sides, we pulled into the Olsons’ driveway and began our tour at the Writing Shack. I am fairly certain my heart stopped for a brief moment when I heard those words. A collection of nearly-untouched and unexamined maps! Having studied cartography for my B.A. in Geography and having a deep and abiding love of maps and geography in general, I may have gotten a tad overexcited at this discovery. This initial enthusiasm led to the rap- id making of plans with Alanna to come back to Ely at a future date and at the very least, catalogue this collection and take notes and photos. But of course, this was not just any collection of old maps. This collection also happened to belong to Sigurd Olson, a man whose writings I identify with so strongly that his words accompany me on every Boundary Waters trip I have ever been on and led. I constantly share his story and knowledge in my academic and personal world whenever the opportunity arises. There was so much potential in those maps! I could not let the chance to investigate them disappear. And so, let us fast-forward the story to mid-March, 2016. While many of my peers headed south for their spring breaks, I went over 300 miles north instead and found myself in Ely for a glorious week of delving into the map collection. And what did I find? The collection contained over 70 maps, varying in their markings and purposes. If I were to tell you about everything I have found so far, it would take pages. However, what I can share with you is that I am now positioned to design a truly unique capstone project that could be a foundation for further research in the future. Multiple aspects will be involved, including educational displays for the exhibit room in the Olson home that highlight some of Sigurd’s maps. Another piece will be inter- active, potentially online features created through the use of Geographic Information Science (GIS). Completion for the initial project is currently scheduled for April of 2017, and though the final project design is still in the works, the grand journey of research and discovery has certainly begun. Editor’s note: Stay tuned as the story continues! The next newsletter will contain a more detailed discussion of the map collection and the exciting features that have been found therein. There is much left to explore!